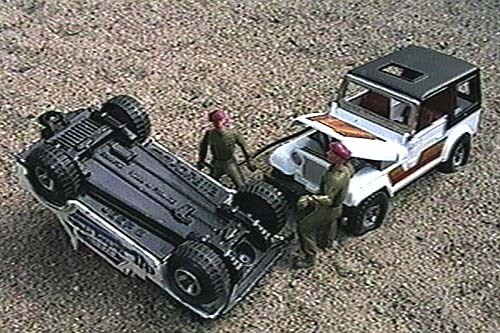 This large 1:32 casting (#3016) from Majorette of France has a plastic hard top and a folding metal windshield. The model came with either a swing-away spare tire or a jerry can (35K JPEG), and in two tire widths. It was also available with a trailer towing either a dune buggy or a motorcycle. The CJ-7s folding windshield was a particularly weak point -- it's hard to find a used one that still has its windshield. The opening hood broke off sometimes too. 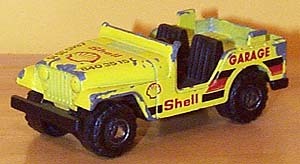 But its large 1/32 size and heavy solid body gave the Majorette CJ-7 lots of play value. Here in the sandbox, the support team pulls out the onboard-air hose to prepare for getting their upset racing Jeep back into competition. 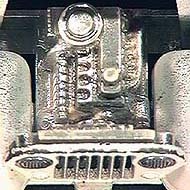 The visible underside of the Majorette is not highly detailed, but includes the essentials. 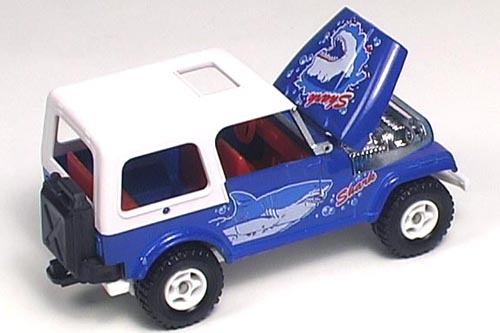 As of 2002, this casting is still available, with various colour schemes and trailers in the "Super Movers" series, but it now has a plastic rather than metal base, and shorter grille slots. This CJ-5 was an early model, manufactured in France with a plastic base. It is labelled as 1:46 scale, which would put it somewhere in the 2000 series, but it appears closer to 1:36 scale. Like the smaller 200-series CJ-5 (see Majorette Small diecast Jeeps), this model had a non-folding windshield. The example seen here was most likely marketed through Shell gas stations. 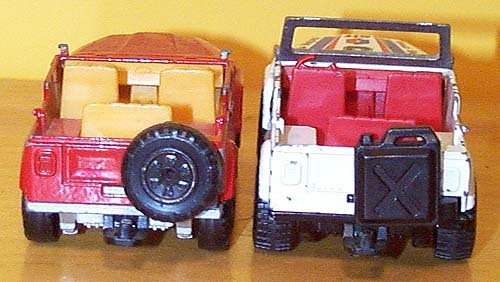 The casting has recently been re-released by Majorette as a Fire Jeep, Farm Jeep, Military Jeep and Construction Jeep (see below) in the Majocar playset series made in Thailand. In the early 1980's, Solido was purchased by Majorette, and after various other corporate purchases and mergers, both Majorette and Solido diecasts are still being manufactured under their own names. Solido was formed in France in 1932, and manufactures very detailed 1:43 models. 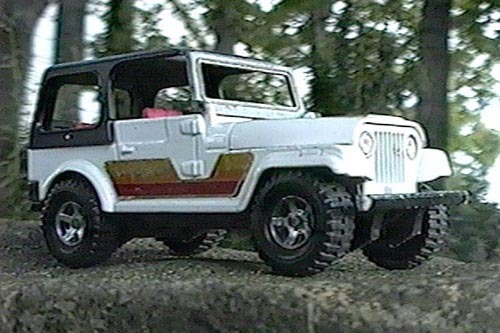 The Solido Willys MB was first released in 1979, and appears mostly in two paint schemes: military or fire service (see the Willys MB Fire Jeep Toys page). The military versions have a folding windshield, like the fire jeeps, or may have a "loaded with gear " hood, like the 50th anniversary of French liberation model. See New French Diecast Jeeps for 2001 for some recent variations. See also Majorette Small Diecast Jeeps and Majorette Diecast Cherokees. Return to the Toy Jeeps Pages.